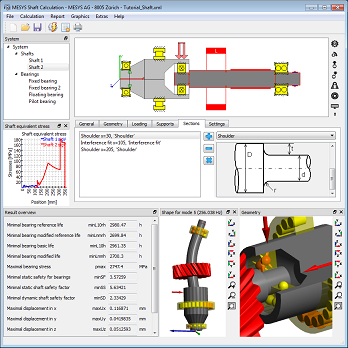 The software allows the calculation of deformation of several coaxial shafts in combination with nonlinear bearing stiffness of rolling bearings. In addition to deformations, forces, moments, equivatent stress and bearing life also the strength according DIN 743 and natural frequencies can be calculated (optional with gyroscopic effect). The MESYS Rolling bearing calculation according ISO/TS 16281 and the MESYS Ball screw calculation are fully integrated into the shaft calculation. All results for the rolling bearings and the ball screws are available in the shaft calculation. For a first impression both a Video and a Tutorial are available. For more information about the features take a look at the Software documentation. A demo version can be found under Downloads. The calculation software is available in English, French, German, Spanish, Chinese and Korean language.